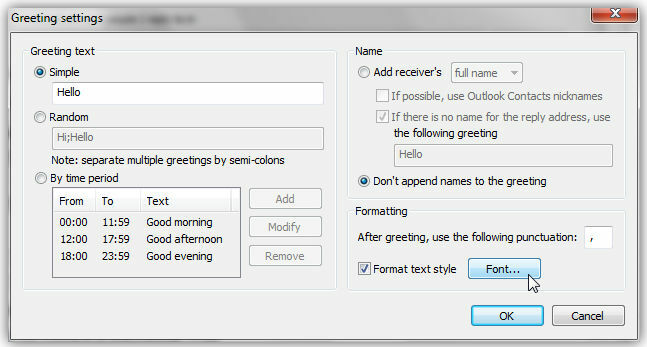 The automatic greetings feature of Bells & Whistles Outlook add-in can greatly increase the productivity of any Outlook user who deals with lots of email replies. The Reply Greetings function allows you to create faster email replies, by automatically inserting a greeting into the reply that you are composing. So instead of typing "Hi John," the program will automatically insert this text for you. Neat, isn't it? When the greetings option is enabled, Bells & Whistles will automatically generate and insert a greeting text to every email reply. This greeting text is generated dynamically, based on your desired greeting intro (Hi, Hello, Dear, etc) and based on the alias name of the email address where the email is going to be sent. For example, if you are replying to john@domain.com and the alias name of this email address is "John Smith", then Bells & Whistles will automatically start your email reply with the text "Hi John,". This way, you don't have to manually type again email greetings. To enable this feature, open the Bells & Whistles options window (from the Outlook Tools menu) and from the Reply Options section, enable the checkbox to "insert greeting when replying to emails". If you with to change the greeting intro text, insert your custom greeting message to the Greeting Text field. you can configure the font style of the greeting text. If you want to use the same format that was used on the email to which you are now replying, simply do not check/mark the box for using a certain text format.